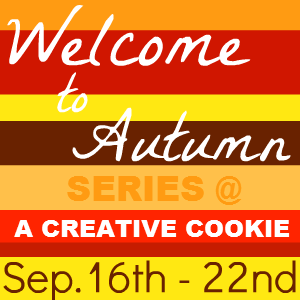 Welcome to the fourth part of the Welcome to Autumn Series! My bloggy bestie Sarah is going to share what Autumn means to her and lots of other bloggers. In case you missed it, parts 1, 2, and 3. Hi I'm Sarah from All Things Blogs. I decided to see what autumn means to most people, to do that I asked some bloggers to tell me what autumn means to them. Let's hear what they said! "Autumn means leather boots, fluffy scarves, and neutral tones. It means snuggling under a blanket watching the leaves turn to the beautiful shades of fall. It is busting out your vanilla creme and cinnamon spice candles that you've been impatiently waiting to burn. It's enjoying your Starbucks caramel latte while wandering through a pumpkin patch, searching for the perfect one to carve. Autumn is knowing the holidays are coming, and preparing to spend time with the people who make your life worth living. "Autumn means.. sweatpants, cuddling, drinking hot tea, SCHOOL!, football and leaves changing color. Those are all the things I love about fall! I love wearing sweatpants while cuddling and drinking hot tea at school while watching football and the leaves changing colors outside. Thanks so much for having me Kate!